Sadio Mane's late equaliser for Southampton denied Jurgen Klopp his first victory as Liverpool manager. The home side dominated possession at Anfield and took the lead when Christian Benteke headed in James Milner's cross from the right. But with four minutes left, Mane bundled in when Gaston Ramirez's header across goal was palmed by keeper Simon Mignolet into the body of the forward. Gegenpressing works - but where's the end product? Played three, drawn three. Klopp has laid the foundations of how he wants his side to play, but does he have right equipment to emulate his achievements at Borussia Dortmund? The Reds have appeared to become, in such a short space of time, a team that is hard to defeat. The energy spent by the hunting packs in closing down space when Southampton had the ball was impressive. Known as a form of gegenpressing - immediate closing down of counter-attacks - the Reds enjoyed over 60% possession and limited the Saints to just three efforts on target. But on the flip side Klopp does not appear to have the necessary attacking players to make that possession count in the opposition's third. Liverpool barely threatened as an attacking force and prior to Benteke's goal they managed just one effort on target. How Liverpool could do with forwards like Mane and Graziano Pelle, who now have 13 goals between them in all competitions this season. Klopp - his options limited by injuries to Danny Ings and Daniel Sturridge - opted to start with Divock Origi as his lone frontman. After a poor display, it is now three matches and no goals for the Belgium international under Klopp. The disparity in performance between the Reds forward, who was replaced by Benteke at half-time, and Pelle was stark. The Saints frontman was the busier of the two despite his side having less possession than the opposition, while Origi managed 10 touches in his 45 minutes - the fewest of any player on the field. "Of course this moment is not the best moment in the week because we wasted a lot of energy. "Southampton haven't lost away from home so we had to work hard. You score the goal and you want to win, but it didn't happen tonight. "Football is not a fairytale. Sometimes we write stories like this but it doesn't happen. You see these guys can play football, are technically strong and physically strong but you saw how big the disappointment was. "It's only a goal, only a game of football. It's like it's the last thing in your life and we have to calm this down." "We deserved at least one point but honestly it was not our best performance but we had a good reaction after going down to a great goal from Benteke. "Our defensive organisation is good, it is difficult to create chances against us. "Teams like Liverpool, if they have a change in management, there is always a change in expectation. I know that, I have played for big teams and I know the expectation on the manager of Liverpool is always bigger than that of Southampton." Liverpool have drawn four of their last five league games (W1, D4). Their 3-2 win over Aston Villa is the only league fixture in which they have scored more than one goal this season. The Reds have scored just nine league goals this season. Only West Brom (8) and Watford (8) have scored fewer. Southampton are unbeaten away from home in this season's Premier League (W1, D4). No player has scored more headed goals in the Premier League since 2013-14 than Christian Benteke (14, level with Arsenal's Olivier Giroud). Liverpool have a League Cup encounter against Bournemouth midweek before they travel to Chelsea, with Jose Mourinho's side in turmoil. The Saints on the other hand face Aston Villa, who are without a manager, in the cup and then host the Cherries next week in the battle of the south coast. Match ends, Liverpool 1, Southampton 1. Second Half ends, Liverpool 1, Southampton 1. Second yellow card to Sadio Mané (Southampton) for a bad foul. 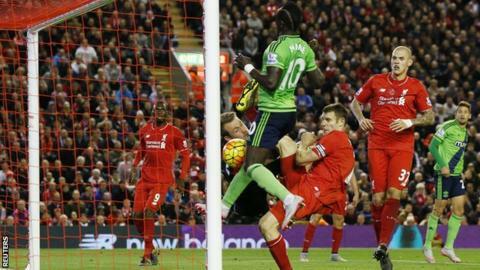 Sadio Mané (Southampton) is shown the yellow card for a bad foul. Goal! Liverpool 1, Southampton 1. Sadio Mané (Southampton) right footed shot from very close range to the bottom left corner. Assisted by Gastón Ramírez with a headed pass following a set piece situation. Substitution, Liverpool. Jordon Ibe replaces Philippe Coutinho. Attempt missed. Sadio Mané (Southampton) right footed shot from a difficult angle on the right is too high. Assisted by Cédric Soares. Substitution, Southampton. Gastón Ramírez replaces Steven Davis. Offside, Liverpool. Lucas Leiva tries a through ball, but Philippe Coutinho is caught offside. Attempt blocked. Graziano Pellè (Southampton) header from the left side of the six yard box is blocked. Assisted by Steven Davis with a cross. Goal! Liverpool 1, Southampton 0. Christian Benteke (Liverpool) header from the centre of the box to the top right corner. Assisted by James Milner with a cross. Attempt missed. Graziano Pellè (Southampton) right footed shot from the centre of the box misses to the left. Assisted by Cédric Soares with a cross. Attempt missed. Emre Can (Liverpool) right footed shot from outside the box is high and wide to the right. Corner, Liverpool. Conceded by Jordy Clasie. Attempt missed. Philippe Coutinho (Liverpool) right footed shot from outside the box is too high. Assisted by James Milner. Substitution, Liverpool. Roberto Firmino replaces Adam Lallana. Corner, Southampton. Conceded by Adam Lallana. Corner, Southampton. Conceded by Nathaniel Clyne.